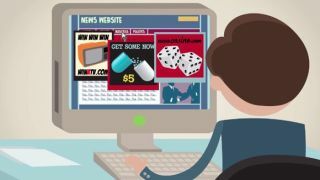 Popular browser extension Adblock Plus announced today that it has started its own ad network called Acceptable Ads Platform, or APP. But wait, you ask, aren't ad blockers supposed to block ads, not serve them? Yes, but Adblock Plus doesn't see ads as the enemy. Instead, the company views bad, intrusive advertising as its real nemesis. "The Acceptable Ads Platform helps publishers who want to show an alternative, nonintrusive ad experience to users with ad blockers by providing them with a tool that lets them implement Acceptable Ads themselves," says Till Faida, co-founder of Adblock Plus, in a press release. Publishers using the Acceptable Ads Platform will be able to drag and drop acceptable ads on their site in real time. Users will still have the ability to opt-out of the Acceptable Ads feature, though miffed users may turn to other ad blockers entirely. Users who do continue using Adblock Plus with Acceptable Ads enabled will be able to provide feedback about ads, helping to tailor ad experiences. "The AAP will offer a feedback mechanism embedded in each ad, which will let you say whether you thought that particular ad was great, good, bad or complete sh*t," writes Adblock Plus. "This feedback will then figure into which ads get selected on a live auction." The APP launches in beta today and will release in full this fall. While today's announcement may shock many, Adblock Plus actually began throttling back on blocking all ads in 2011 with the introduction of its acceptable ads feature. Ads deemed non-intrusive were whitelisted by the company. This whitelist did draw criticism as it allowed companies like Google, Microsoft and Taboola to pay to have their ads on the list. This gave the impression Adblock Plus had a double standard when it came to ads from certain firms. Though Adblock Plus acknowledges ads can be a problem, it's working with publishers to ensure their sites are still making money from users running its extension. "We don't hate all advertising, just the really of obnoxious stuff," says Adblock Plus PR Manager Ben Williams. Adblock Plus revealed that 83% of its users agree that it's only the obnoxious ads they want to avoid. The company claims consumers understand that free content must come at the cost of advertising, and that's why it launched the Acceptable Ads Platform in the first place.